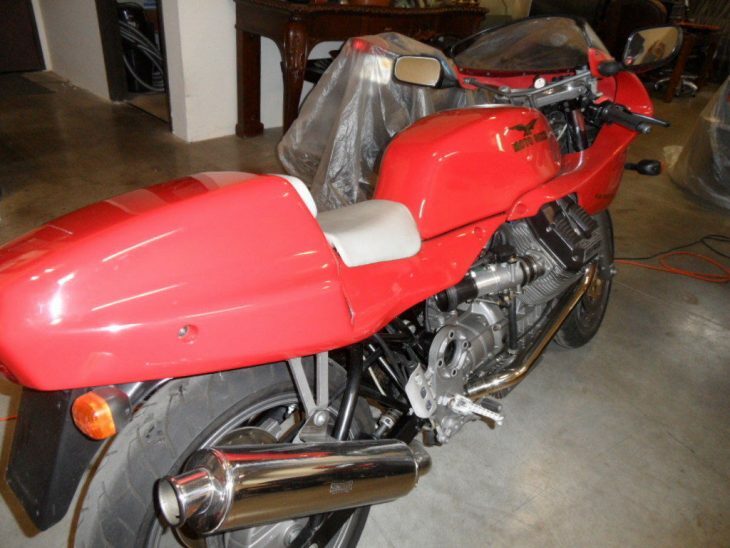 Shaft drive has well-known advantages in terms of maintenance and reliability but is rarely seen in the sportbike world as it limits gearing choices and generally adds too much weight to a bike like this Moto Guzzi Daytona Racing. In a world where every ounce counts and bikes are pared to the bone, sacrificing durability for agility, a driveshaft seems a step backwards. But although they played around with a chain-drive, liquid-cooled, v-twin to rival Ducati prior to their purchase by the Piaggio Group, Moto Guzzi was generally happy to just stay afloat and were often forced to work with what they had. Given their financial limitations, they have managed to develop the system to a very high level. Guzzi was stuck with the durable, but very clunky and outdated five-speed transmission but, in the Daytona, they curbed some of the more intrusive shaft-jacking by using a parallelogram rear suspension, although you’ll still feel the rotational forces of the longitudinal crankshaft as you power out of turns or rev the bike at a stoplight. Because of course you’ll rev the bike at stoplights: Moto Guzzi’s big v-twins are some of the very best-sounding twins on the planet, especially when fitted with a freer-flowing exhaust. The four-valve engine has "OHC" cast into those valve covers, but it’s not really “overhead” and more "high cam" as the cams operate the eight valves via a system of short pushrods and rockers, a system that offered the best of both worlds, with compact dimensions and good high-rpm breathing. A bit of a bridge between the earlier Daytona 1000 and the later RS, the "Racing" uses the earlier, hump-backed bodywork with some of the factory available engine hop-up parts. It was never officially available in the USA, as evinced by the odometer reading in kilometers. 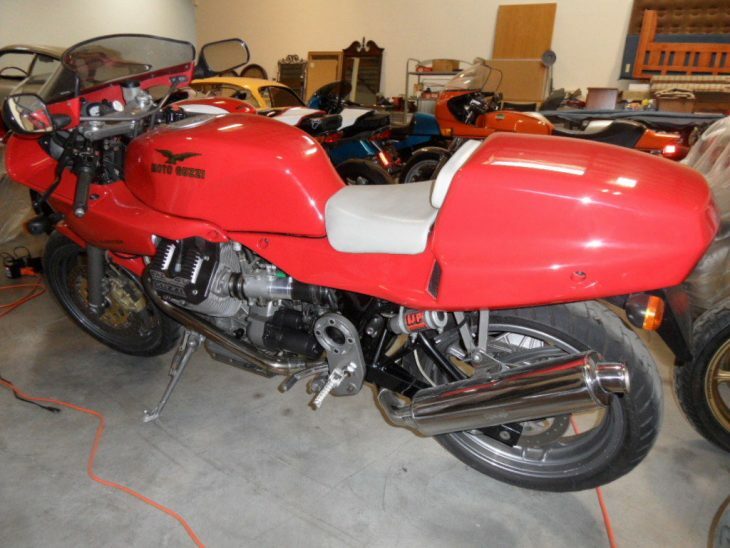 The seller claims this is is fitted with an 1100cc engine, but I believe all of the Daytonas had the 992cc engine, built to make it eligible for various race classes that limited twins to 1,000cc or less. Production of the Daytona stretched from 1992 to 1995 and saw a bit more than 1,000 examples built, with just 100 of the "Racing" version at the tail end of production for 1996. 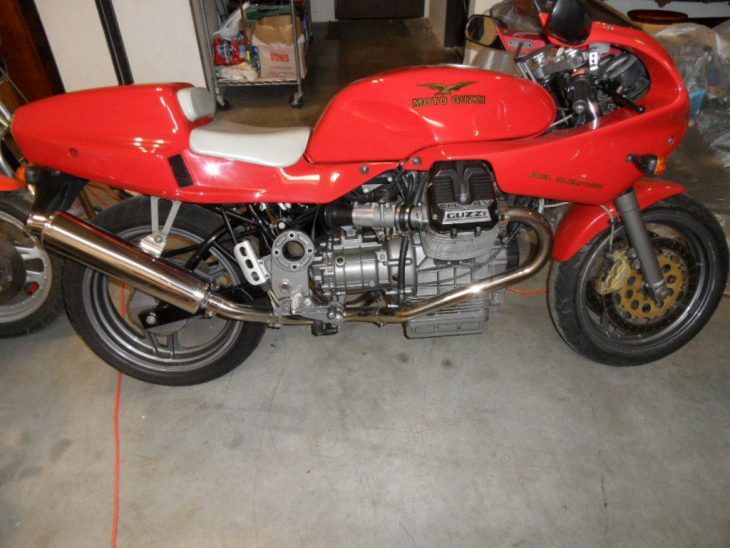 1996 Moto Guzzi Daytona Racing, number 100 of 100 ever made 4 valve twin, mint condition. Rare Stay In Tune stainless steel exhaust system, new battery, recent fluid change and tune up, low mileage: 21,446km. Part of large collection that is being liquidated, 1100cc 4-valve twin, this bike is a joy to ride, we at buyer's expense can ship worldwide. Clean, lien-free title, this is a no-issue bike that is beautiful and rare. Bidding is up to 7,600 with the Reserve Not Met. 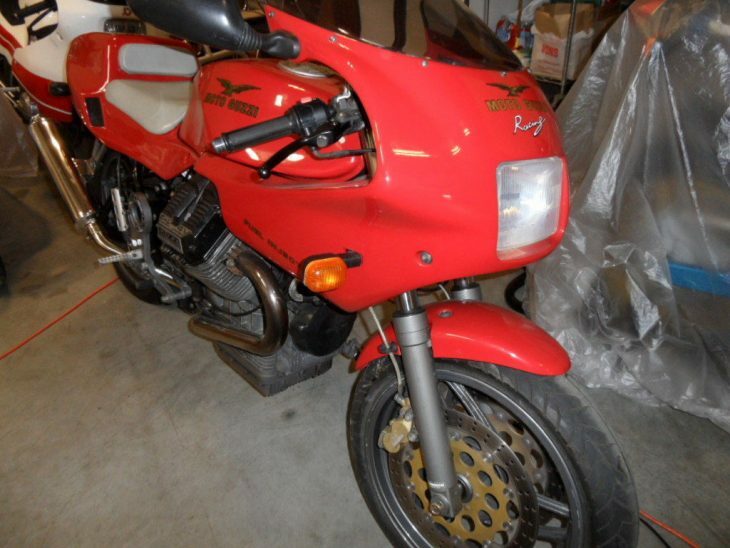 No surprise there as sellers are generally looking to get at least $10,000 for nice examples, with one recent low-mileage bike selling for over $14,000! But more often, these Daytonas are a hard sell: they don’t meet their reserve or receive little attention from bidders. 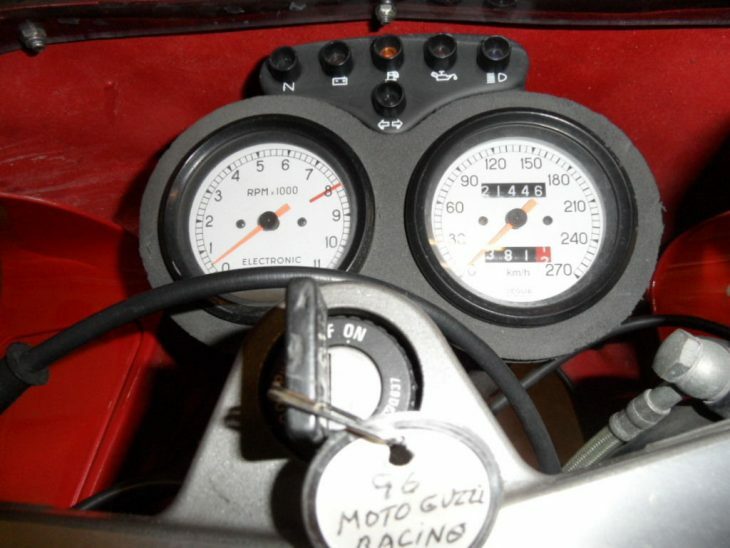 Mileage on this example is pretty low, especially for a Guzzi, with a little more than 13,000 miles worth of kilometers rolling under the wheels. The Staintune exhaust may be a bit too shiny for your taste, but they are a quality brand and those… less restrictive pipes should help make the big v-twin sound great and add a little bit more oomph.